Beamforming arrays date back over 100 years, and were first used in the military for determining the bearing and location of aircraft, ships, and submarines. Until the mid 1970’s, when microprocessors became widely available, these arrays were 100% acoustic and fairly primitive. Modern software development and digital signal processing techniques have substantially advanced the state of the art of this technology. With good design and engineering, it’s now possible to employ an advanced microphone array system to capture desired sounds and produce a highly intelligible, superior-quality audio signal. Also known as spatial filtering, beamforming can be applied to both sound waves and radio energy, and thus is sometimes discussed in the context of cellular telephones, wireless networking, biomedicine, sonar, seismology, and even radio astronomy. This paper focuses exclusively on beamforming as a method of sensing and filtering acoustic waves for enterprise video and telephone conferencing applications, and describes emerging techniques and technologies to improve the capture and processing of acoustic patterns, and the clarity of human speech in corporate conference rooms. By combining elements [i.e., antennas or microphones] in a phased array, so that signals at particular angles experience constructive interference while others experience destructive interference, beamforming can be used to achieve spatial selectivity and elimination of unwanted signals. Beamforming microphones are part of a larger family of mics considered to be high-directionality, or perhaps ultra-directional microphones, due to their stunning sound quality, advanced performance, and similarities to phased-array radar. As all sound professionals know, an omnidirectional microphone is one that picks up sound from all directions. The disadvantage of omni mics is that they often result in a sound feed that is reverberant, or hollow, and full of ambient noise from all directions in a room. A basic directional microphone still in common use today is the cardioid mic, perfected in the early 1940’s. Cardioid mics sound less reverberant and less noisy than omni mics because they attenuate off-axis reflected audio and noise by reducing sound pickup from the sides and rear. But cardioid mics have limited selectivity or filtering capabilities, which can be surpassed using beamforming technology. Beamforming can be used to select, or focus on, just those sounds or voices that you want conference participants to hear, while rejecting all unwanted sounds. Selecting desired sound sources and rejecting undesirable sounds has been the goal of audio engineers for most of a century. With acoustic beamforming and integrated digital signal processing made possible by modern microprocessors and software, this is now technologically possible. Traditional directional microphones may be used in conferencing applications to perform limited spatial filtering to improve audio quality. These microphones have an acoustic pattern that selectively picks up desired sound waves in one region of space and rejects others. Beamforming is a signal processing technique carried out by a processor using input from the beamforming microphone array. The signals from the various microphones are combined such that signals at particular angles experience constructive interference, while others experience destructive interference. 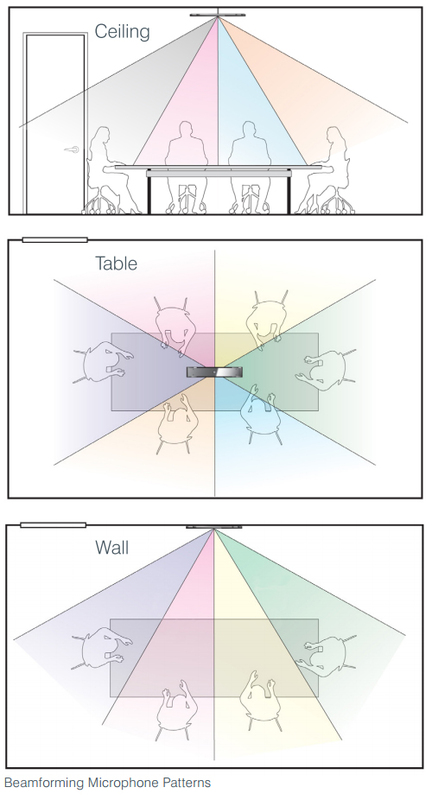 Superior spatial selectivity can be achieved using beamforming techniques so that certain regions (sound directions) can be amplified, and other regions can be significantly attenuated. Beamforming processing components can also be configured to attenuate unwanted sounds originating from the direction of a door or window into the conference room. To adjust and tune the directionality of the array to focus on desired sounds, a beamforming array system adjusts the phase and amplitude of the sounds reaching each microphone, to create a pattern of constructive and destructive interference in the wave front. Information from different microphones is then combined such that the expected acoustic pattern is preferentially processed and fed into the conferencing audio stream. 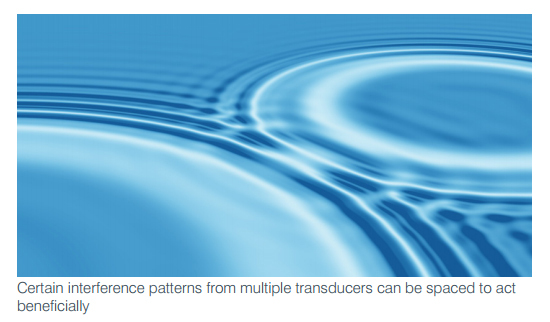 Advanced beamforming techniques employ interference patterns to change the directionality of the array, so that information collected from the various microphones can be combined to give preference to the expected acoustic patterns. Adaptive beamforming algorithms may also be included to automatically adapt to different situations and environments. The most advanced, state-of-the-art enterprise video and teleconferencing systems today employ professionally engineered beamforming microphone arrays and associated components and processors. It’s common practice in audio/video teleconferencing systems to deploy a grouping of cardioid microphones, placed on a tabletop or mounted in the ceiling. When each directional mic is properly aimed at an individual and connected to a professional conferencing mixer, excellent audio pickup can be achieved. Similar results can be accomplished with wireless lapel or hand mics. In a boardroom environment, however, there is frequently a desire to maintain a clean, cultured, corporate image, and a collection of microphones resting on tabletops or hanging from ceilings can be visually disruptive and damaging to interior designers’ esthetic goals. Integrated three-microphone arrays offer a reduction in the number of visible microphone elements, but nonetheless have a hard technical look that may also inhibit an ultra-clean, styled appearance. Other disadvantages of tabletop and ceiling microphone strategies include the extra work that goes into maintaining numerous microphones, checking wireless batteries and sound levels, the inconvenience of worrying about whether everyone has remembered to clip on their wireless mics, whether any noise is being introduced, and constantly optimizing mixer levels. There are also high costs associated with mics, mounts, stands, cables, installation, and upkeep. In contrast, a modern beamforming mic array delivers the ultimate in convenience, speech intelligibility, sound quality, and reliable communications. Beamforming arrays are less visually intrusive, and when mounted strategically, can disappear unobtrusively into the background. With an array on a conference room table or mounted on ceiling or wall, the various microphone elements in the array, along with associated steering algorithms, digital signal processing, and echo cancellation can “zoom in” acoustically on individual conference participants and deliver sound quality that is superior to traditional conference room sound-gathering methodologies. The convergence of modern conference room interior design with advances in acoustic technology and digital signal processing is accentuated by the recent availability of the ClearOne 24-element Beamforming Microphone Array, the first solution of its kind in the professional audio industry. Made possible by ClearOne’s beamforming technology, digital signal processing, adaptive steering, and nextgeneration acoustic echo canceling processes, the 24-element Beamforming Microphone Array system is a groundbreaking, integrated teleconferencing system consisting of microphone capsules, on-boardprocessing, advanced software, and a connected digital electronics mixer stack. As many as ten traditional microphones can be removed from a conference room and replaced by the sleek, attractive enclosure of the beamforming array. The onboard intelligence, spatial filtering, and signal processing capabilities of the integrated system give it twice the pickup range of other microphones and significantly reduce height, distance, and angle constraints. Each Beamforming Microphone Array unit operates in collaboration with a ClearOne CONVERGE® Pro conferencing system, which shares processing tasks and provides echo cancellation, noise cancellation, filtering, gating, level control, and adaptive acoustic modeling to deliver the most natural conferencing audio experience possible. The combined beamforming and signal processing technologies automatically steer tightly-focused audio pickup beams towards people speaking, and filter out unwanted sounds and reflections to reduce room noises and eliminate those hollow reverberant sounds that commonly plague conference room environments. Beams that would be aimed towards unwanted regions, such as windows, doors, or noise sources, can be disabled by the installer in software. Up to three beamforming arrays can be attached to each supported CONVERGE Pro system, and as many as sixteen beamforming arrays along with six required CONVERGE Pro conferencing systems can be networked together to provide coverage in multiple regions, rooms, or portions of a building. The ClearOne Beamforming Microphone Array is a plugand-play device that can be easily configured, customized and installed. Minimal configuration is required, since the technology is completely internalized. The array’s sophistication, and its associated software, processors, and electronics are so intelligently implemented, that a technician with average audio conferencing skills is capable of performing the installation and configuration. The ClearOne Beamforming Microphone Array is no more complicated to install and setup than any other microphone. Integrators experienced in the installation and configuration of typical conference microphones can easily configure the array. The only connections required are a single Power over Ethernet (PoE) and one audio connection to the expansion bus of the CONVERGE Pro unit. No custom cables, no wiring terminal blocks, or any other connections are needed. Although completely customizable to meet the needs of nearly every application, the ClearOne Beamforming Microphone Array default configuration works right out of the box. Unlike standard conference microphones which require experience in configuring proper gain structure between devices, the Beamforming Microphone Array is pre- configured to work directly with the internal gain structure of the CONVERGE Pro. When installed according to ClearOne guidelines, the only adjustments will be minor gain changes to customize levels for your application. In the world of professional audio and video teleconferencing – beamforming microphone arrays and their associated mixers, digital signal processors, and echo-canceling functions represent the newest, most advanced technological innovations, breaking new ground for teleconference sound fidelity, clarity, and intelligibility. Modern beamforming technology has the proven ability to surpass traditional techniques for clearly capturing and reproducing human voices in conferencing applications, and rejecting unwanted sounds, to optimize collaboration and understanding among conference participants. When conveniently installed in conference center ceilings, walls, or tabletops, beamforming microphone systems deliver the best, most unobtrusive options for the physical placement of microphones, making them the superior choice for flawless conferencing audio in any setting. ClearOne is the leading global provider of audio conferencing, Unified Communication & Streaming multi-media solutions. The reliability, flexibility & performance of our comprehensive solutions save organizations time & money by creating natural environments for effective & efficient personal & group communication. Our products enhance collaboration, presentation, distance communications & multimedia applications.